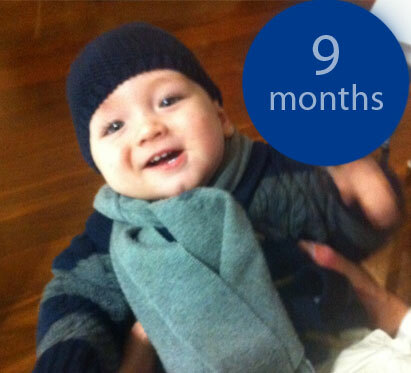 Our little boy has turned 9 months already. He has 7 teeth and wants to walk most of the time, with our help ofcourse. But I am not suprised if he starts walking by himself soon, the cheeky little boy he is. One thing we love to do is hug...those thight hugs with his arms around my neck, so sweet. He stands up alone in the bath, cot and with help of the furniture. When meeting other woman, they want to show me pictures of their baby girls, or baby nieces and tell me that they ( matteo and the babygirl) make a nice couple in the future... Is this normal that woman already think fo far in the future? I found it hilarious that it happened 3 times already. We went to London last weekend, hopefully soon i can post some pictures, we had a lovely time, wich I would love to show. he is absolutely positively precious!